32nd and Morgan Streets. @fatcityarts on Instagram. This converted storefront used to function as an apartment gallery, hosting visual art shows and bands. Since last September, it has been the home and workspace of sculptor and performance artist Cameron Clayborn, musician Will Cabaniss, sculptor and dancer Miles Jackson, and fashion designer Vihanga Sontam. Instead of running a gallery, the artists now mostly focus on their own practices, though they still welcome the public in for concerts, parties, and pop-ups. The residents have their studio spaces in the house, in addition to a small woodshop in the garage, partly shared with Future Firm, the architecture firm next door. The front room is an open space that serves as platform for the residents’ projects. Everyone in the house is at an exciting hinge in their work. Sontam and Jackson just released their clothing label, Vihanga, with a first collection, “Arrival,” created from fabrics bought in Sontam’s hometown in India and entirely made at their Fat City studio. The release party happened on March 23 in the front room, with a sculptural rack made by Jackson in the wood shop, and the clothes are now for sale online. Clayborn, who was just admitted into the prestigious MFA program at Yale, is hard at work on his side of the studio, preparing pieces for a solo exhibition opening at Simone Subal Gallery in New York City on April 7. In the spring, Cabaniss (a contributor to the Weekly) will use the space to launch his new vocal-instrumental group, for which he has been composing and arranging for the past months. “Because we come from such different backgrounds,” said Sontam, “trying to bring so many different people together, it’s almost like a different kind of cultural production.” This allows them to work together when they host events, integrating visual art with music, fashion, and dance, and attracting a mixed crowd. 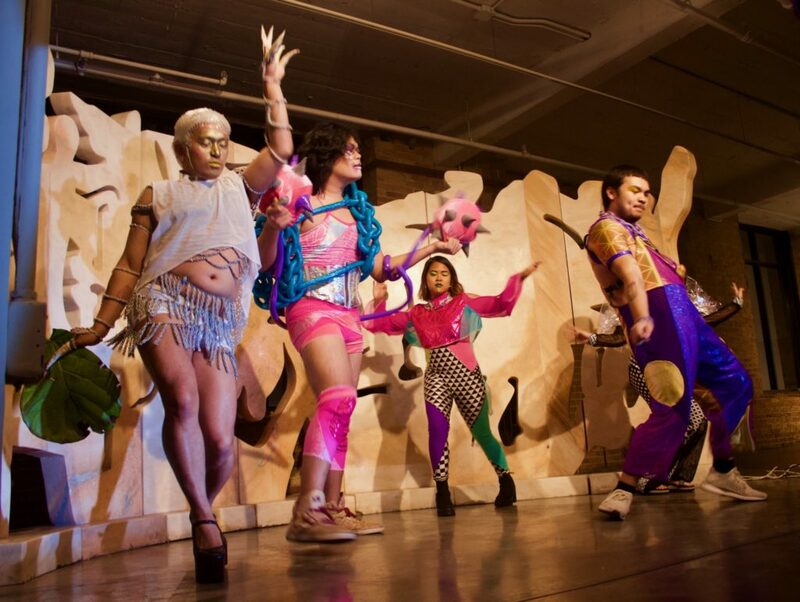 In 2010, DFBRL8R—also known as Defibrillator Gallery or dfb—was formed as a DIY artist-run space to revive performance art in the city’s contemporary art scene. Over the next eight years, they operated out of spaces along Chicago Avenue. Last February, it was invited to curate and program out of the Zhou B Art Center in Bridgeport, cutting overhead costs significantly. 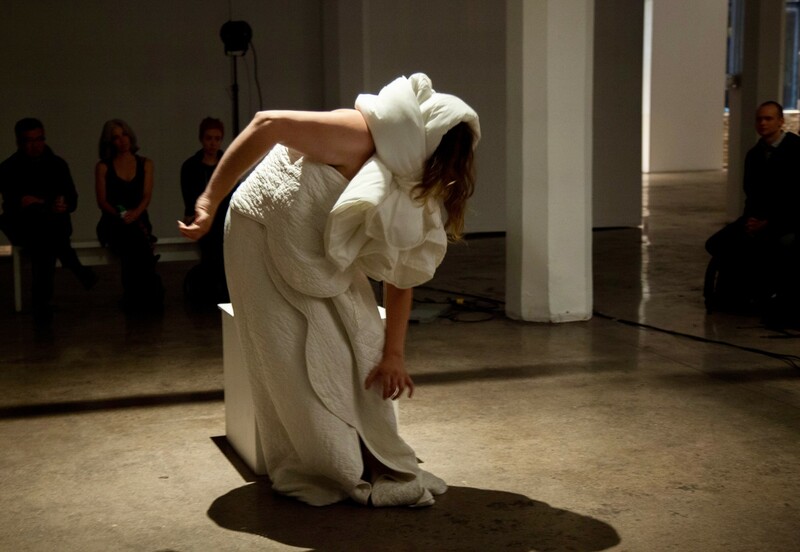 The programming tends to showcase a mix between emerging and well established artists and makers, global and local, often setting the tone for performance discourse in the city. Around the same time that DFBRL8R moved to the Zhou B Art Center, S.Y. Lim, an SAIC graduate, was also offered space at there to open her own gallery. She started out on the first floor, close to the parking but immediately found herself struggling to show work in the small space allotted to her. After some discussion, she was able to move into the basement, allowing her to curate and install a variety of shows that range from performances to group shows. A visual artist, former KPOP singer, and now a photographer, Lim selects artists to show after extensive studio visits. Founded by Andre and Frances Guichard, Gallery Guichard has been in Bronzeville for over fourteen years. With the aim of bridging the gap between underrepresented artists and collectors, the gallery showcases a range of mediums, including painting, sculptures, ceramics, and furniture. It specializes in the art of the African Diaspora. Andre Guichard is a self-taught painter and Frances Guichard has been painting under the pseudonym Marlene Campbell since 2004. Sometimes, they show their own work in the space, but they’re committed to finding a variety of artists to showcase, sometimes even traveling abroad to find them. 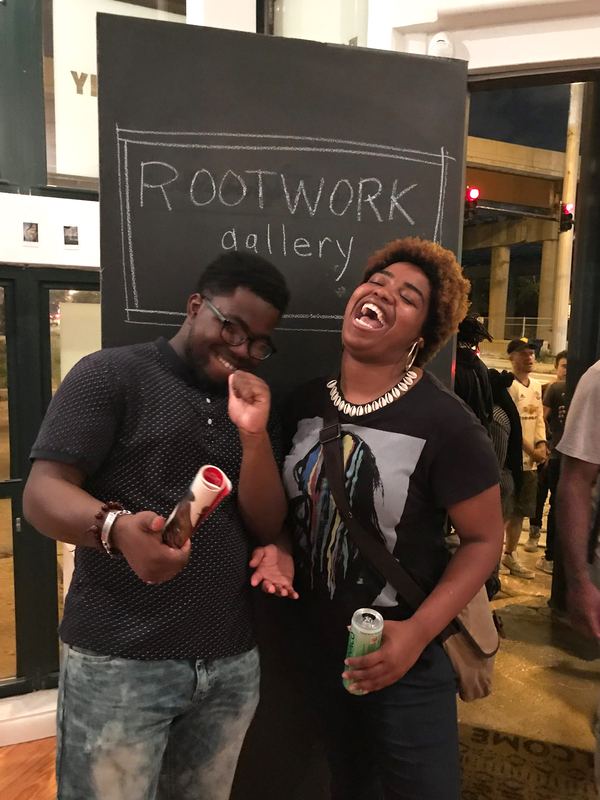 The gallery is located on the first floor of Bronzeville Artist Lofts, Guichard frequently collaborates with other artists in the space to offer art programming to engage the residents of Bronzeville. With the mission to offer a space for artists who make time-based work, LITHIUM opened its doors in October 2017. The idea was to build what Nicky Ni, one of the founding members, describes as a “gray space” that sits between a black box and a white cube gallery setting. Ni was able to fund the space with his winnings from of SAIC’s 2018 Make Work Challenge. 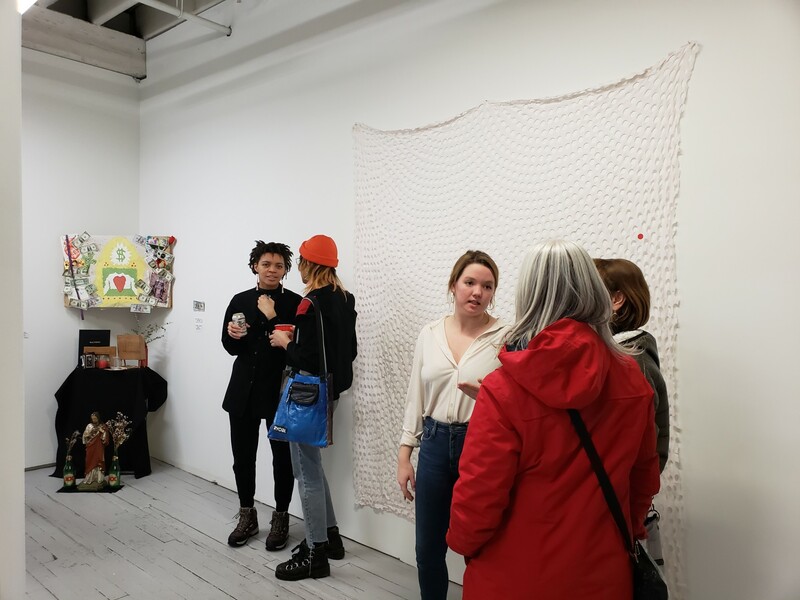 They chose the Halsted Street strip of galleries in eastern Pilsen because it draws a regular crowd of art-goers on Second Fridays. “The main vision that drives the work we show is this idea of premiering. So if it’s Chicago-based artists, then they are likely to show new work here and if it’s an international artist then they could show older work that a Chicago hasn’t seen before,” Ni told me. Founded by SAIC alumni Alden Burke and Stephanie Koch, Annas is “a generative and reflective space for young makers.” A newer space that opened its door in December, Annas has hosted three events to date, which have highlighted collaborations between makers and their use of the space and skills of the founders. Its first show, “object/item/material/me,” resulted from a partnership between Annas and The Overlook, another artist-run space. The long-term goal of Annas is to use the space to host three residencies that invite a cohort of artists to work together. trap house chicago uses streetwear to transform society. Founded by Mashaun Hendricks, trap house, the second in his series of concept stores, is an extension of his practice both as an artist and activist. Hendricks is a conceptual artist who works with screen printing, designs, streetwear apparel, text and wheat-paste installations. In December 2019, Hendricks opened the doors to his second concept store on 79th Street in Chatham, right next to Haji Healing Salon, a wellness center. Each concept store serves as a physical space for his streetwear brand Trap House Chicago and to engage with the community through workshops and dialogues. Art Music Fashion Magazine, or AMFM, is a brand and web magazine that gives emerging artists a platform through curated events, pop ups, collaborations, and web content. In 2009, Ciera McKissick created a web magazine as part of undergraduate thesis at University of Wisconsin–Madison. She gave it life in Chicago in the form of a Pilsen gallery, where she put together a team to curate events across the city, run the magazine, and create opportunities for emerging artists working across all mediums. She aims to cultivate a community based on diversity, inclusivity, and intergenerational interaction. “We want to be accepted, not tolerated,” she said in an interview. The gallery closed in 2018, and McKissick has taken some time off to reflect on her experiences and rethink ways to keep AMFM growing in a sustainable way. However, despite not having a physical space, AMFM continues to actively program and collaborate across the city. Founded by Tracie D Hall, director of the Joyce Foundation’s Culture Program, Rootwork is an experimental space dedicated to showing and sharing artistic expression aimed at healing, reconciliation, or investigation, focusing on folk art, street art, and indigenous cultures. Last July, the space celebrated its three-year anniversary. For Hall, the location has been sacred, because it came to her in a dream, in which her grandmother sent her an image of a building at the crossroads of a highway. On the crossroads of 18th and Ruble Streets, the space has been home to an array of shows since its opening. In the last month the space hosted Synergy, Chicago’s Latina-founded, interracial women’s hip hop arts collective. 31st and Throop Streets. @Satellite_chicago on Instagram. All of these spaces are free and open to the public. Most of their gallery hours revolve around exhibition and are by appointment, so we recommend calling or emailing them ahead of time to look at the works and engage with the space. Checking their Instagram and Facebook pages for programming updates can also help you determine the best times to visit. Correction, Wednesday, April 10: An earlier version of this piece incorrectly identified Joseph Ravens, the founder of dbrl8r, as Joseph Raven. Manisha AR is the Weekly’s chief of staff and a writer who graduated from the New Arts Journalism program at the School of the Art Institute of Chicago. She is interested in film, video, performances and storytelling. Her last story for the Weekly was on David Maljković’s show at the Renaissance Society last month. Marina Resende Santos is a contributor for the Weekly. She works with art administration and research in the humanities and graduated with a degree in Comparative Literature from the University of Chicago. Her interviews with artists and organizers have appeared in Lumpen Magazine and THE SEEN.